Next to teeth, bones are the hardest structures in the human body. While we perceive them as rigid, bones do "give" a little when physically stressed. Bones can break if stressed too much. In some cases, they may crack instead of breaking all the way through. With some types of bone breaks, a bone actually shatters. Some diseases like osteoporosis or cancer make bones more fragile so they are more prone to injuries like fractures. Trauma to bones can even cause bone bruises. Doctors use a variety of terms to characterize bone breaks. 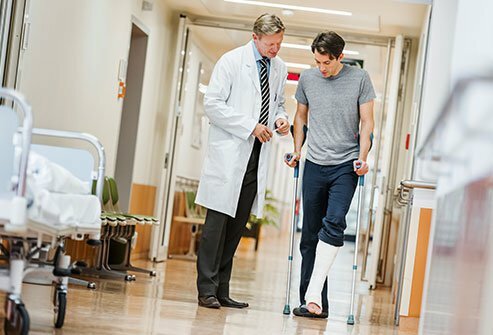 The degree of the break and whether or not there is an open wound associated with the break are a few factors doctors use to characterize bone fractures. A closed fracture is one that does not break through the skin. It is also called a simple fracture. The opposite is a compound, or open fracture. This type of fracture where the bone breaks through the skin. A partial fracture is one where the bone is not broken all the way through. A complete break describes a fracture where the bone is broken into two or more pieces. If the pieces of a broken bone line up, this describes a non-displaced break. If the pieces of a broken bone do not line up, this describes a displaced fracture. A greenstick fracture is one in which the bone bends and cracks, similar to a tree branch that is bent. These types of fractures usually happen in children under the age of 10 who have soft bones. There are several other terms doctors use to characterize bone fractures. A transverse fracture is a bone break that goes straight across the bone. An oblique fracture is a bone break where the bone is broken at an angle. A comminuted fracture is a bone break where the bone shatters into at least 3 pieces. A stress fracture is a hairline fracture that often occurs in bones of the feet or legs due to repetitive impact such as from running. 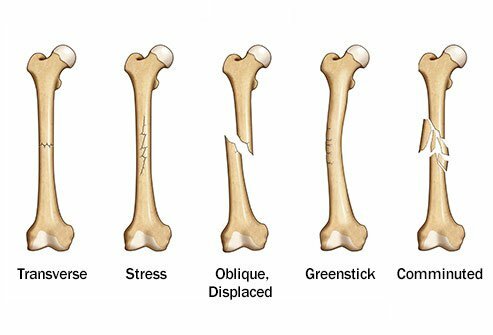 A greenstick fracture is where the bone bends on one side and breaks or cracks on the other, similar to a fresh tree branch. There are other types of bone fractures besides the ones listed above. 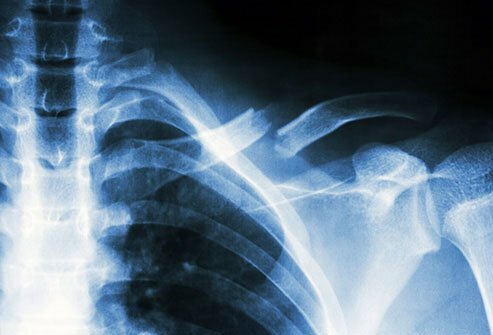 The most common sites in the body for fractures are the clavicle (collar bone), wrist, ankle, and hip. It is also possible to break bones in the forearm (ulna and radius), lower leg (tibia, fibula), the back (vertebra), and other bones in the body. Sometimes a small fracture does not hurt or cause immediate pain. Sometimes a person who suffers a fracture is in shock, so they may not immediately feel pain from the bone break. Some fractures are very painful. The pain is either a deep, intense ache or it may feel like a sharp pain. Children who get small fractures may not experience any pain and may not even realize they broke a bone. You may also get the chills or feel dizzy or woozy if you break a bone. Some people pass out. You may notice that the affected area of the body does not look right. You may not be able to move the affected area as you normally would. A broken bone may look like it is bent at an odd angle. In the early stages of fracture healing, the injured area becomes swollen and a blood clot forms at the site of the break. Immune cells remove debris and fight any germs that are at the injured site. 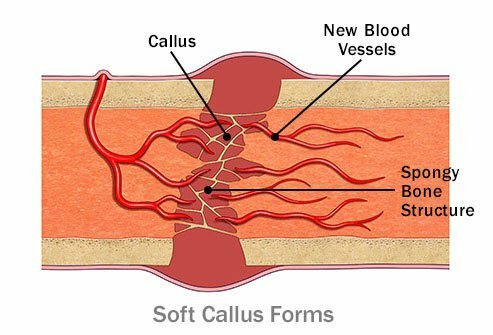 The body grows new blood vessels around the area to aid in the healing process. The blood vessels deliver oxygen and nutrients to the broken bone to help it heal. They also deliver immune cells that facilitate the "clean up" of the site. The acute healing phase after you suffer from a broken bone lasts for a few days up to approximately one week. 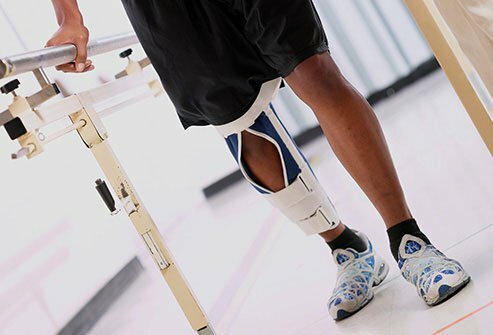 The first part of the reparative phase of bone healing occurs approximately 4 to 21 days after a bone fracture. During this phase a soft callus forms around the broken bone. 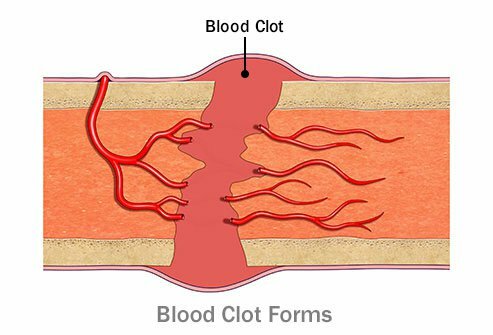 Collagen migrates to the area and gradually replaces the blood clot. 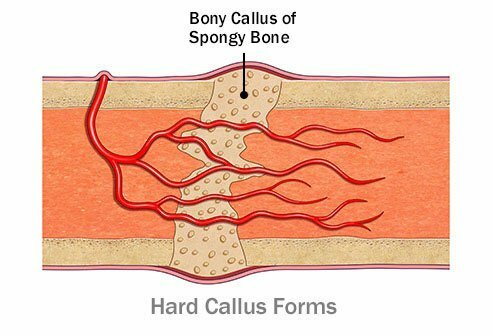 The callus is not as strong as bone but it is more stiff than a blood clot. That is why it is so important to have a cast during healing. It holds the bone in place while healing is occurring. If the bone moves during this time, the callus may break and further delay recovery. The hard callus reparative phase of bone healing begins about 2 weeks after you have suffered a fractured bone. Cells called osteoblasts add minerals to the tissue to form new bone in the bridge between broken pieces of bone. The resulting tissue is called a hard callus. This phase of bone healing is over approximately 6 to 12 weeks after a bone break. 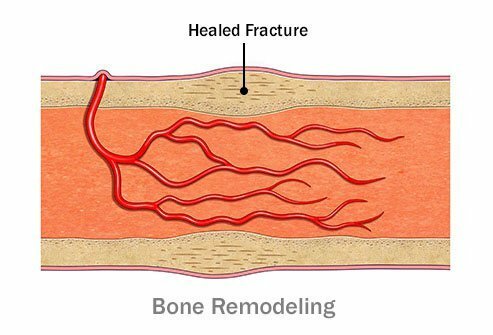 The remodeling phase during bone healing refers to the process of new bone formation. During this phase, cells called osteoclasts remove any excess bone formed so that a bone retains its original shape. Your doctor may advise you to resume your usual activity in this stage because it will actually help the bone heal. This is the longest stage of healing. It may last as long as up to 9 years after you experience a fractured bone. Treatment for a broken bone involves setting the bone back in place. 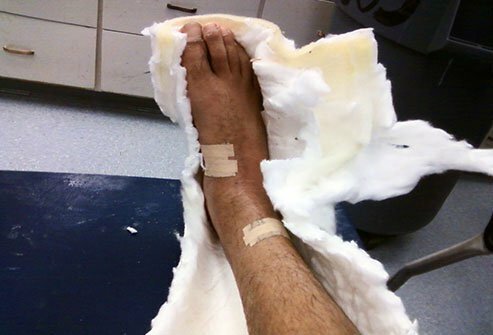 The orthopedic doctor may use a case, splint, or a brace to keep the bone in place and immobilize the affected limb. 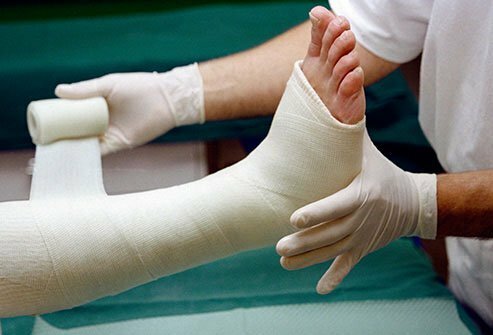 Casts are typically made of plaster or fiberglass. 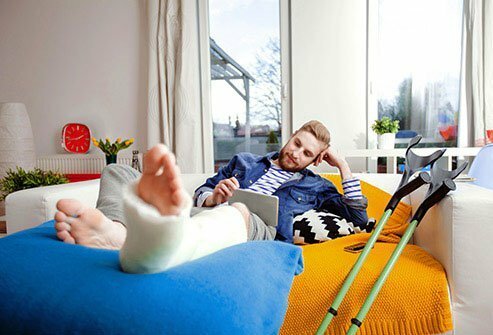 Depending on the type of fracture and the location of a fracture, the cast, brace, or splint may completely immobilize the affected area or it may allow for limited controlled movement of nearby joints as long as it will not interfere with healing. The doctor may prescribe medication for pain. 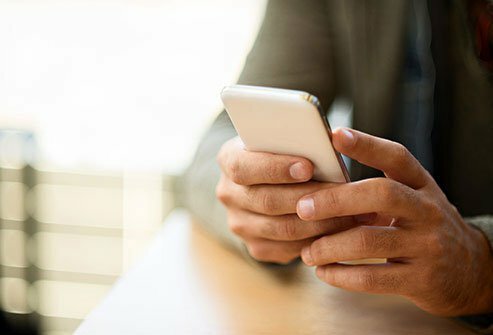 If you suffer a complex bone break, such as a bone that punctures or protrudes out of the skin, or another type of severe break, complex treatment may be required. You may need surgery. Sometimes, orthopedic surgeons use pins, screws, plates, or rods to hold pieces of bone in place so they will heal correctly. Some of these may stay in the body after the injury has healed. Other times they may be removed after healing has occurred. For some types of breaks, traction is needed. 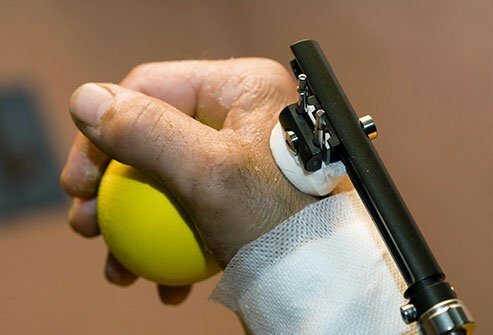 Traction is a system of pulleys and weights that keep bones in the correct position so they can heal. It can take from several weeks to a few months to recover from a bone break. Factors like your age, overall health, and the type of break you suffered all have an effect on recovery time. It is especially important to follow your doctor's instructions after you suffer a fracture for the first 1 to 2 weeks. Do not push yourself. Rest as directed and do not use the affected part of your body. Practice good self-care. Do not smoke. If your doctor prescribes physical therapy for you, do the exercises as directed. Eat a healthy diet and make sure you are getting enough calcium and vitamin D to rebuild healthy bone. It is important for your broken bone to be immobilized during healing, but muscles begin to atrophy when you do not use them. You may get weak and stiff. If your doctor prescribes physical therapy during this time, do the exercises as instructed. It will help alleviate stiffness and build muscle. Movement also helps break down scar tissue. You may also start getting used to gradually using the injured body part again, however slowly and gently. Your doctor may order an X-ray to check the progress of healing of the injury. At this point in your healing, the doctor may remove the cast. Since your skin and hair have not seen the light, you may notice body hair that is much darker than usual. Your skin may be extra pale and flaky. The affected area will look smaller than you are accustomed to seeing it because muscles have atrophied from lack of use. Follow medical advice and keep doing physical therapy as directed by your doctor. Get back to normal with your usual activities within the limits set by your doctor and physical therapist. Activity will help you fully recover, but overdoing it could set back your recovery. The diagnosis and treatment of common types of fractures is fairly straightforward. If you experience any of the following symptoms and signs, you should see your doctor. If areas of your skin turn blue or your cast feels too tight or too loose, see your physician. If you cannot move your fingers or toes, seek immediate medical attention. If you develop swelling, redness, fever, or a foul-smelling discharge near the site of injury, you may have an infection so see the doctor. Worsening pain is cause for concern. You should also see your doctor if you develop numbness, tingling, or pins and needles feelings in your affected limb. American Academy of Orthopaedic Surgeons: "Fractures (Broken Bones)." Hoppenfeld, Stanley and Vasantha L. Murthy. "Treatment and rehabilitation of fractures." Lippincott Williams & Wilkins, 2000. Injury: "The Biology of Fracture Healing." The Nemours Foundation: "Surgeries and Procedures: Casts and Splints."